A total of 2,638,958 passengers chose to fly with Norwegian in January, 305,026 more passengers than the same period last year. The total traffic growth (RPK) increased by 18 percent and the capacity growth (ASK) increased by 27 percent. The load factor was 76.1 percent. 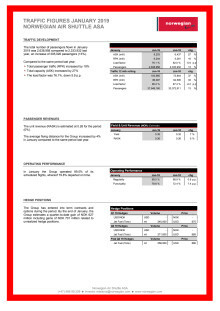 “We are very pleased with the continued passenger growth in January, a month traditionally characterized by less demand. Norwegian has been through a period with significant growth, but now the company will change its strategic focus from expansion and growth to profitability,” said CEO of Norwegian, Bjørn Kjos. 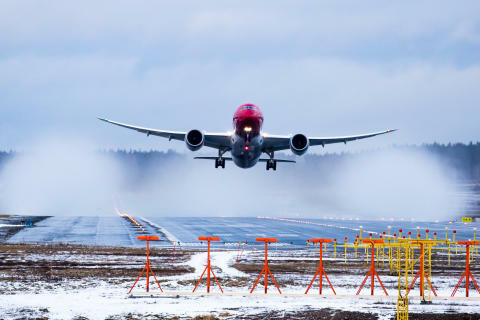 Norwegian operated 99.5 percent (up 0.6 percentage points) of the scheduled flights in January, whereof 79.8 percent (up 7.4 percentage points) departed on time. 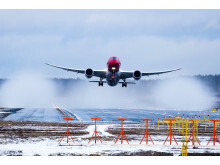 Norwegian is a listed company on the Oslo Stock Exchange and is the world's fifth largest low-cost airline operating 500 routes to 150 destinations in Europe, North Africa, Middle East, Thailand, Caribbean, the U.S and South America. In 2017, Norwegian carried around 37 million passengers. Norwegian has almost 11,000 employees and a modern, environmentally friendly fleet of more than 150 aircraft with an average age of 3.7 years. Norwegian has been voted ‘Europe’s best low-cost carrier’ by passengers for five consecutive years at SkyTrax World Airline Awards from 2013-2017, along with being awarded the ‘World's best low-cost long-haul airline’ in 2015, 2016 and 2017.